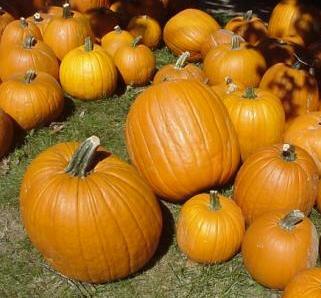 It's important with Pumpkins that you pick an area that gets full sun and has plenty of room. Pumpkins have vigorous vines and will sprawl all over the place. It's possible that a single vine will grow up to 30 feet long. 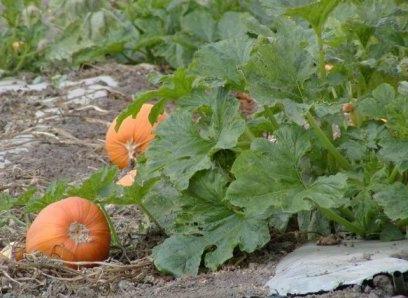 Pumpkins make a great intercropping plant with other vegetables, such as Corn and Beans. The Corn supports the climbing Beans, and the Pumpkin vines are trained to grow below the Corn. In addition the large leaves of the Pumpkin plant provide shade that suppresses weeds and helps retain soil moisture. Both the Pumpkins and the Seeds can be harvested for food source.